Lot 17-2 at road side (Aldouane Station Cross Road). The land survey is completed and the property is rectangular in shape and measures roughly 440 feet wide and 975 feet long. 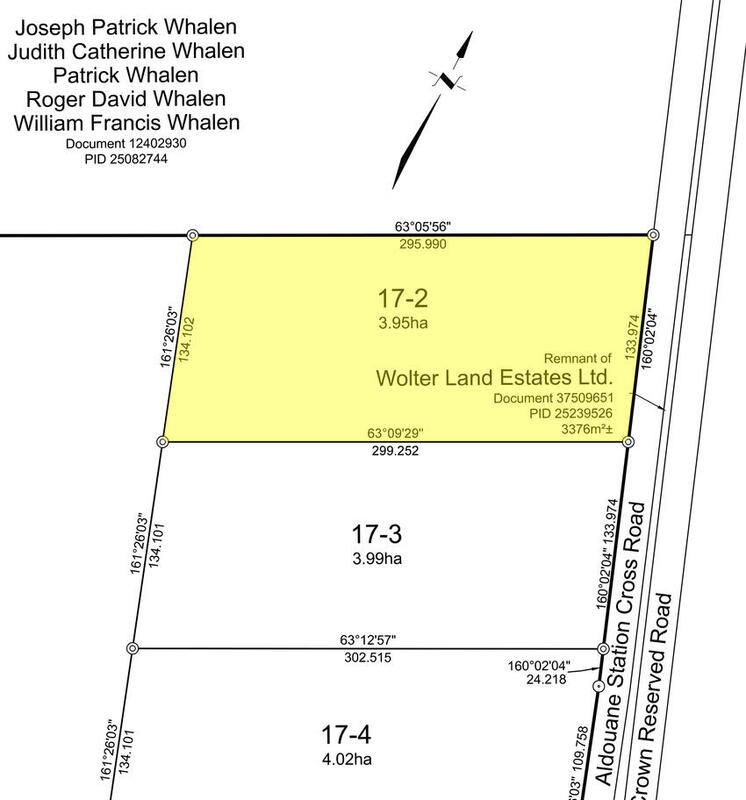 Here is the road frontage of your property at Crossmans Corner. This picture was taken within Lot 17-2. 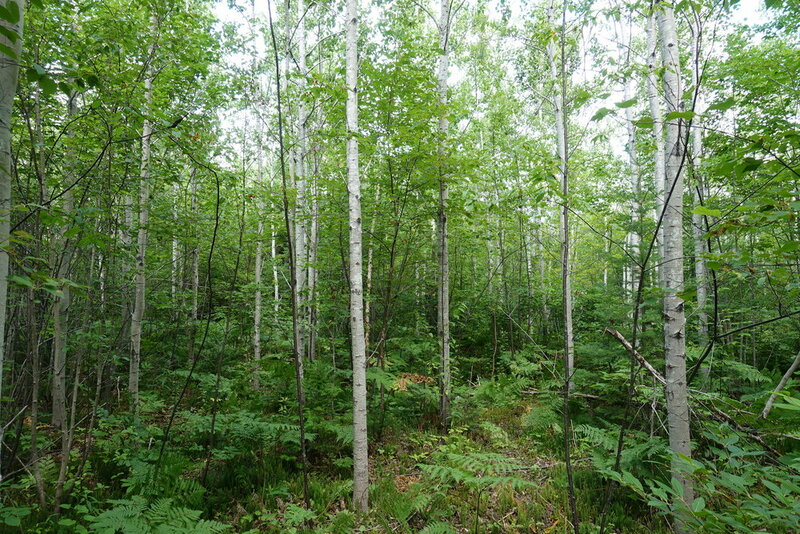 The land is treed throughout in Poplar, Maple, Fir, Spruce. Another picture taken on your land. 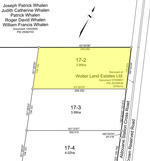 With nearly 10 acres there is ample room for a variety of land uses. 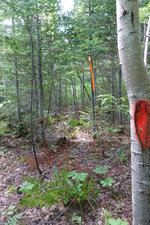 This picture was taken along the newly surveyed property line. Winter picture on Lot 17-2. Another picture taken on Lot 17-2. Picture taken along the Station Cross Road. Lot 17-2 is on the left. An air photo indicating the lot boundaries. See subdivision plan picture below for the lot measurements. Nearby Richibucto River and Molus River. Here is a survey plan highlighting Lot 17-2. The lot measurements are shown in meters. 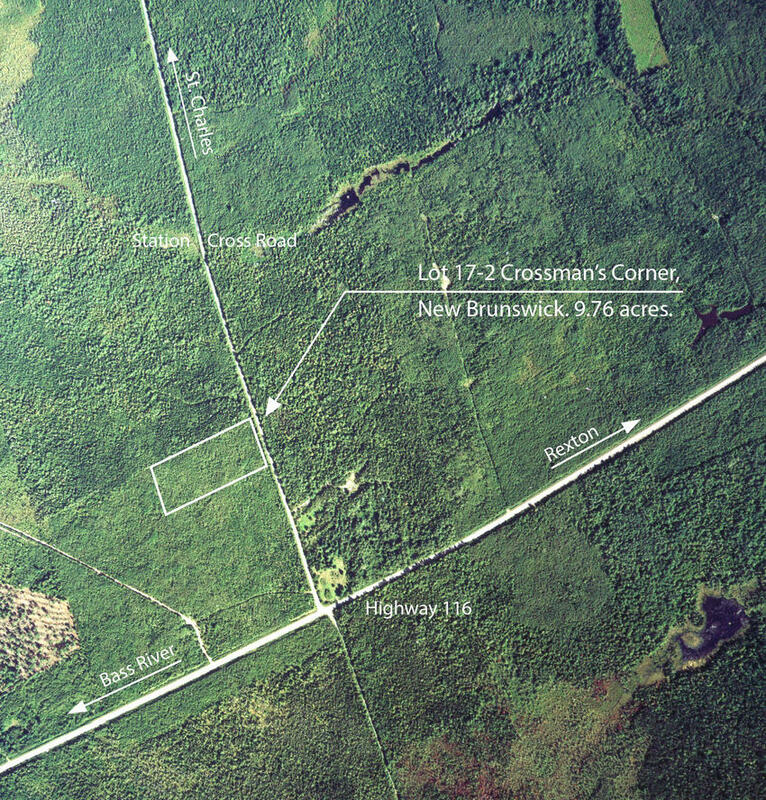 Here is an air photo indicating the location of this acreage at Molus River (Crossmans Corner). 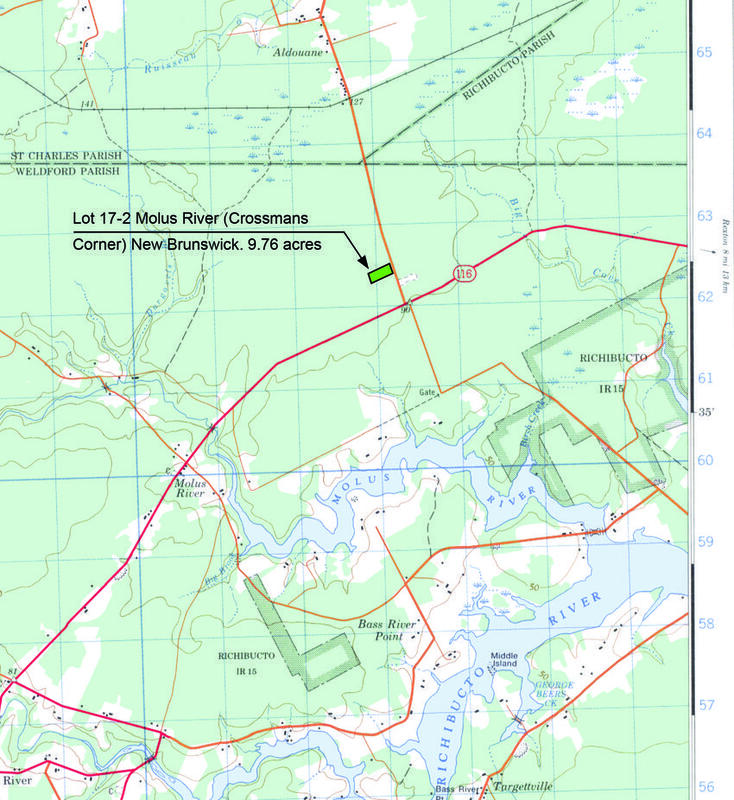 Here is a topographic image outlining the location of this acreage. The land is dry and well draining sitting at an elevation of approximately 98 feet (30 meters). 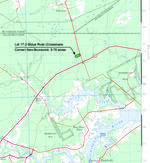 A map showing the location of your land north of Moncton. Ideally located in rural New Brunswick yet still an easy drive to the city and coast. 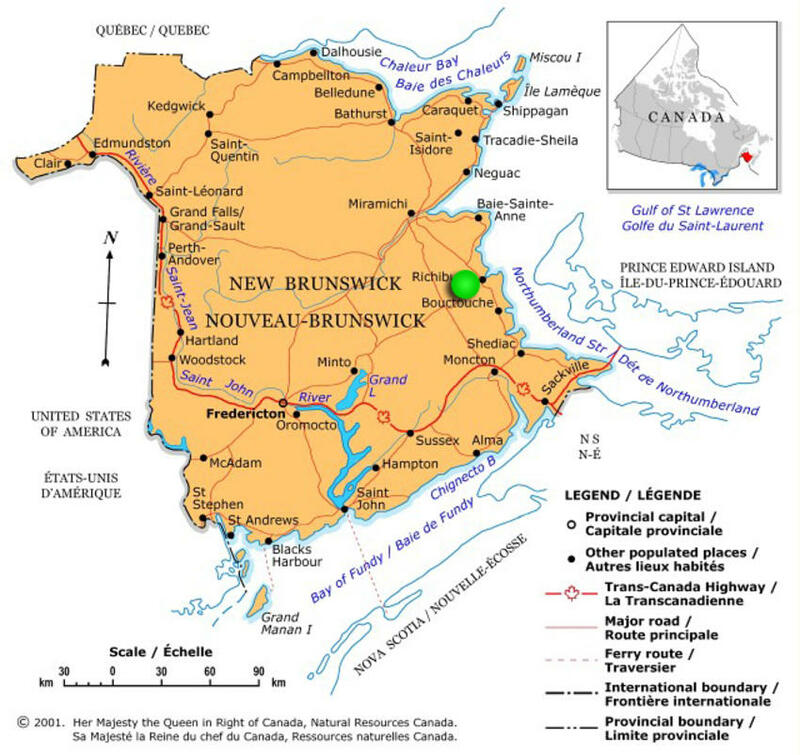 A map showing the location of the property in the Province of New Brunswick (green dot). 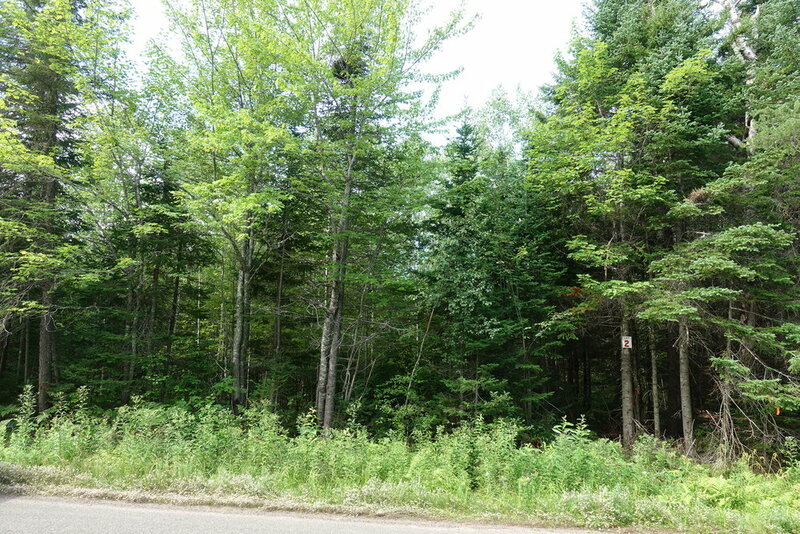 Land for sale situate along Aldouane Station Cross Road at Molus River (Crossmans Corner), in the Parish of Weldford, in the County of Kent, and Province of New Brunswick, CANADA. - 439.5 feet (133.9 meters) road front. - 971.1 feet (295.9 meters) long. 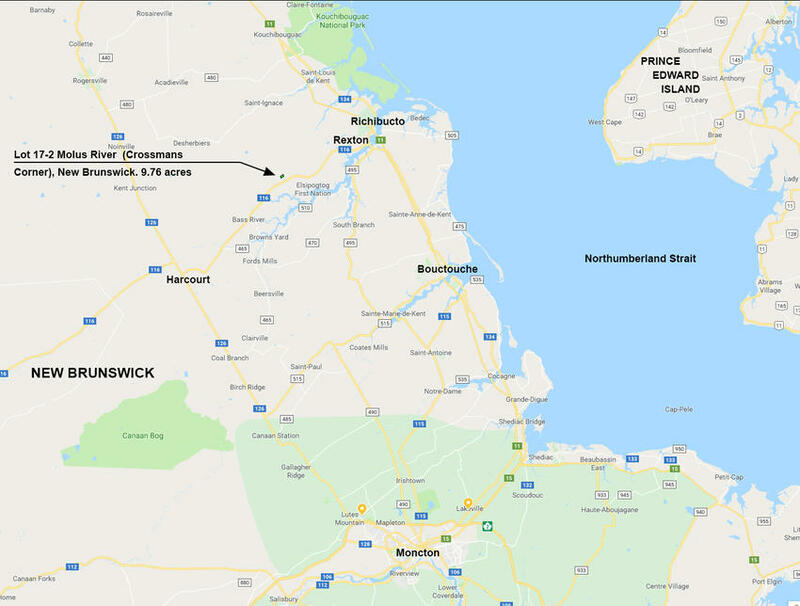 - Located at Molus River (Crossmans Corner) east of the community of Bass River, north of Moncton, and west of Rexton and Richibucto, in the Province of New Brunswick Canada. - Close to Molus River and Richibucto River and Bass River - great fishing and boating! - No power and telephone. - Beautifully treed with poplar, and fir and spruce evergreen trees. - About a one hour drive to the city of Moncton and International Airport. - Less than 20 minutes to the towns of Rexton and Richibucto along the Richibucto River and Northumberland Strait (Gulf of St. Lawrence). - Less than 30 minutes drive to the Kouchibouguac National Park. - 1 hour drive to the city of Miramichi and world class salmon fishing on Miramichi River. 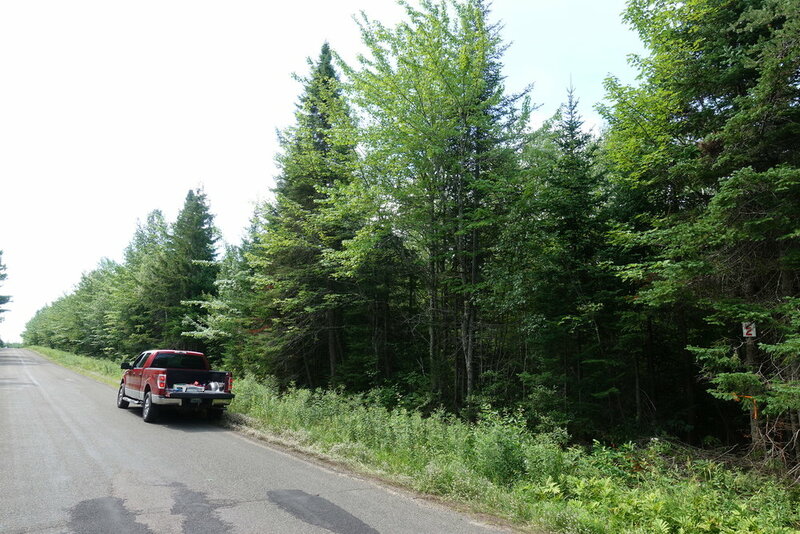 This is a wonderful off-grid spacious large plot of land in rural New Brunswick yet with great year-round access along Highway 116 at Molus River (Crossmans Corner). 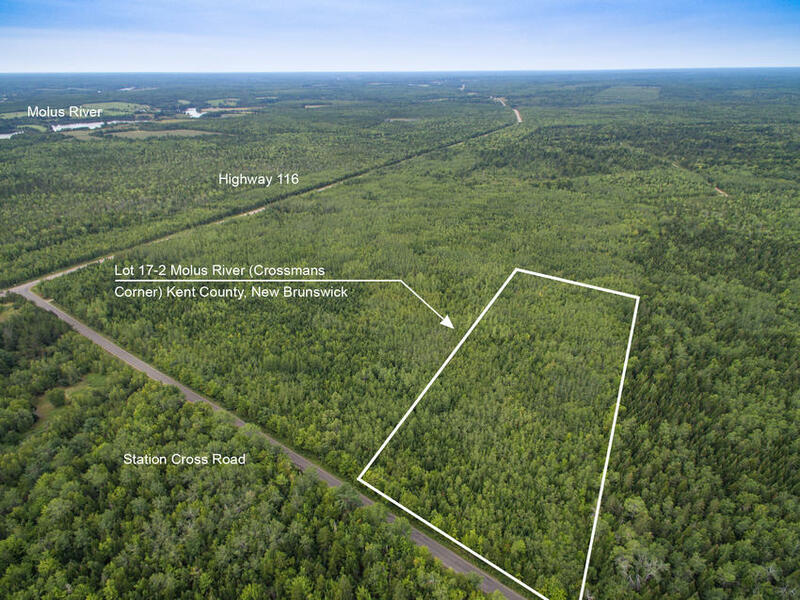 The land sits on the westerly side of Aldouane Station Cross Road, just north of the intersection with Highway 116 which leads east to the coastal communities of Rexton and Richibucto and west to Bass River and Harcourt. A land survey was recently completed and the land measures 439.5 feet of roadfront (133.9 meters). Southern, Western and Northern land boundaries measure 981.8 feet (299.3 meters), 439.9 feet (134.1 meters), and 971.1 feet (295.9 meters) respectively. 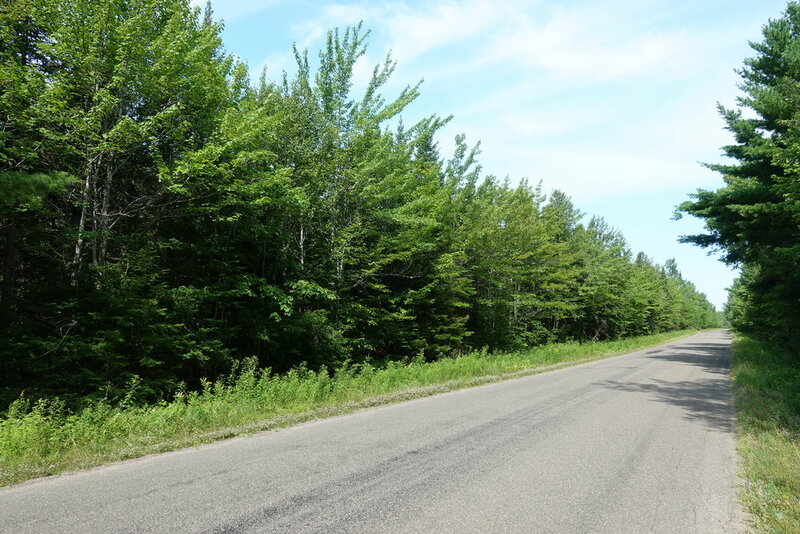 The parcel is accessible year-round via a great network of maintained highways and roads. 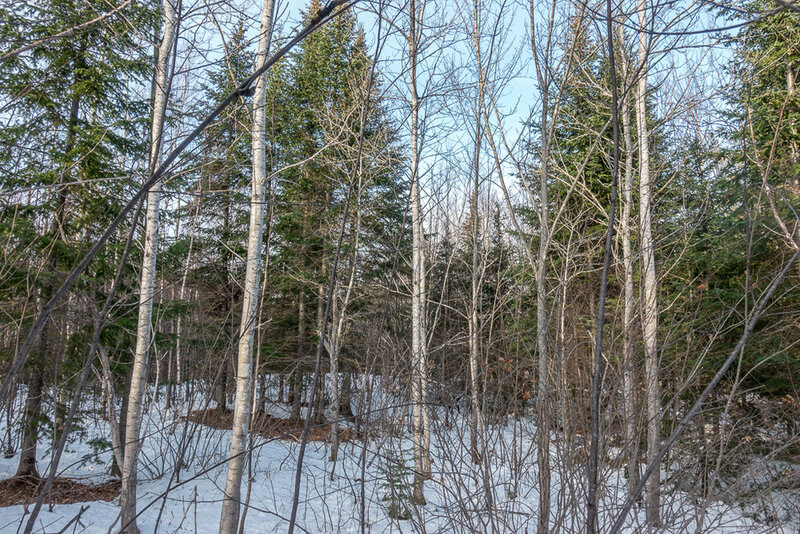 Near the land are hundreds of acres of adjoining crown lands as well as the Trans-Canada Trail (Trail # 52) reached just a couple kilometers north of your land, connecting you to thousands of kilometers of maintained and marked recreation trails across the Province of New Brunswick. This is a great property for those looking for a rural acreage within a convenient distance from the city. A nice investment in Canadian Land. Topography of the land is generally level throughout the parcel averaging 98 feet (30 meters) above sea level. 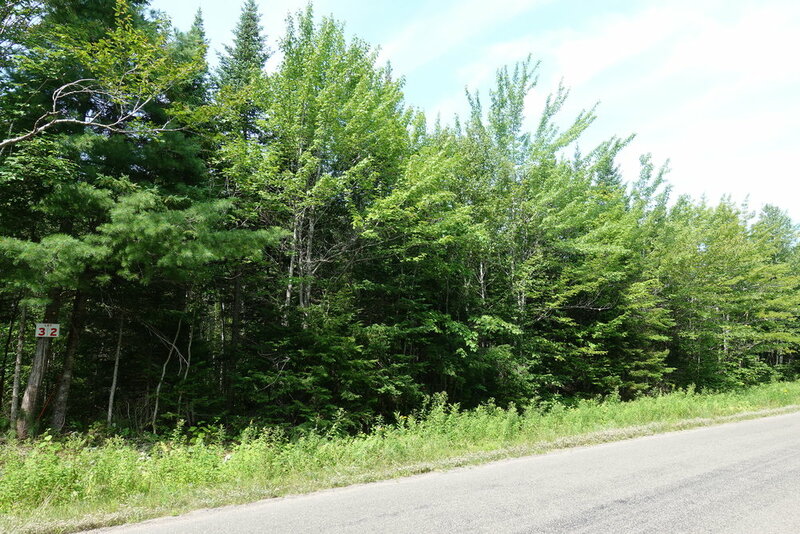 The land is nicely wooded throughout in maturing Poplar and Maple deciduous trees and Fir and Spruce Evergreen Trees. The forest was pre-commercially thinned years ago to promote growth and the trees are well spaced and understory sees lots of sunlight. The forest supports a diverse natural habitat of wildlife and birds. 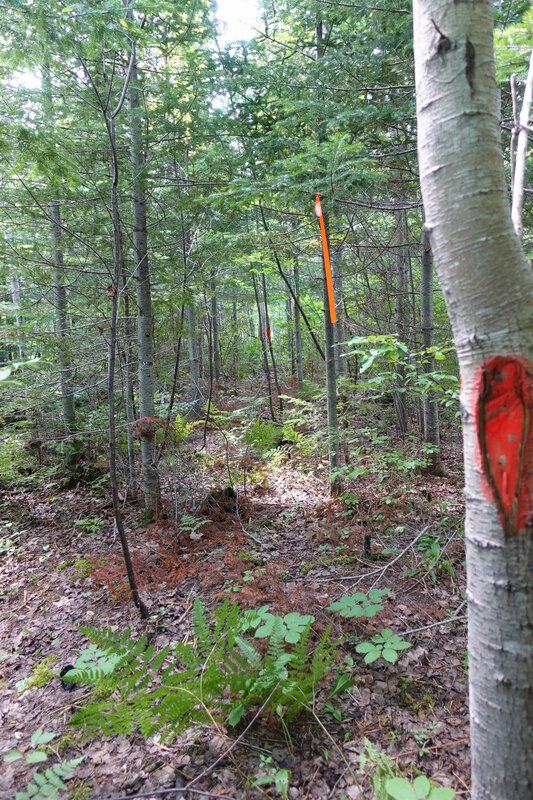 For those who enjoy hunting, this is an excellent area for White-Tail-Deer, Moose and even Black Bear. Small game such as rabbit as well as grouse, partridge and ducks and here in numbers. 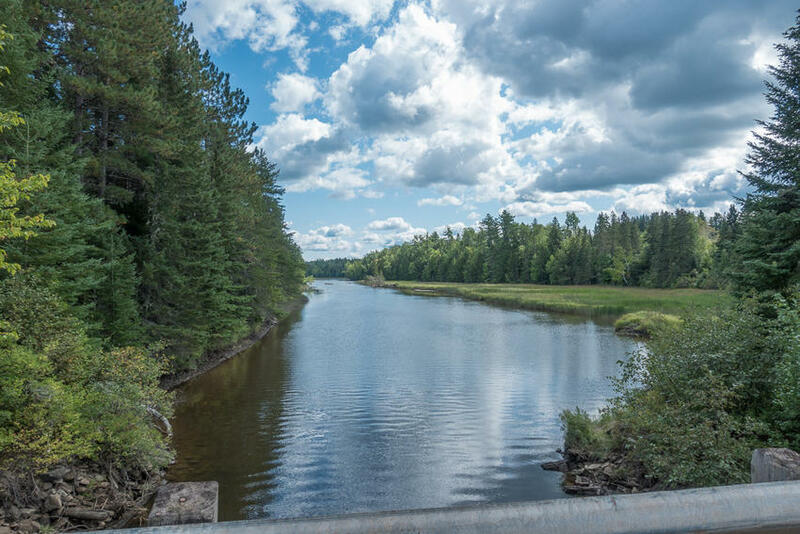 It is only a short drive from your land to access the Richibucto River and the Molus River which is a poplar body of water for boating, fishing and water activities. Pontoon boats and motor boats are common here - you can boat all the way out to the towns of Rexton and Richibucto, continuing out to the Northumberland Strait (ocean waters). 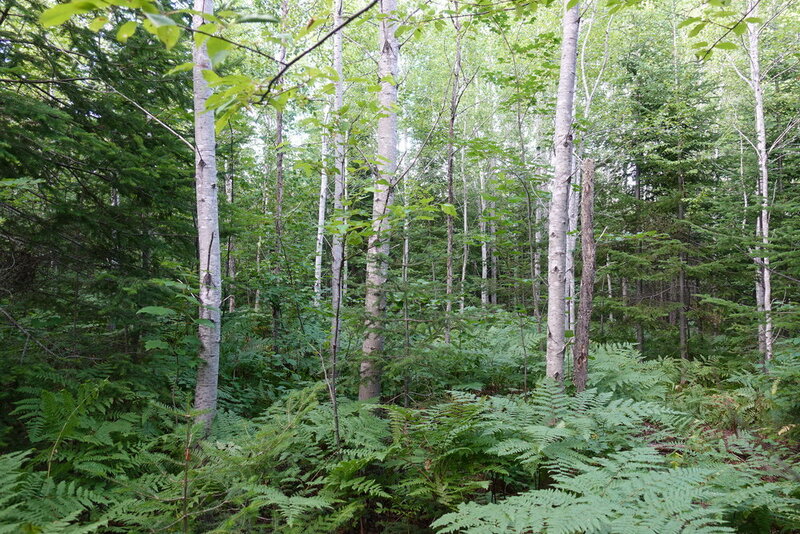 Your acreage is within convenient driving distance to the city of Moncton. Route 116 westward from your land leads to the community of Harcourt and then south on Highway 126 takes you to Moncton about one hour distant total. Moncton in the province of New Brunswick’s largest city and urban centre and has an international airport. North on Highway 126 from Harcourt takes you to the town of Miramichi and the renowned salmon fishing river, the Miramichi River. Your acreage is within convenient driving distance of the coastline. Route 116 eastwards from your land will take you to the Northumberland coastline and communities of Rexton and Richibucto and up to the Kouchibouguac National Park - sand beaches, warm ocean water and fresh seafood are within easy reach! The Northumberland Strait is home to the warmest ocean water temperatures in Canada, with some areas reaching 77 degrees Fahrenheit or 25 degrees Celcius. 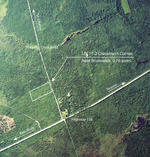 An great acreage for the outdoor enthusiast and one that you and your family will enjoy for years to come! Sorry, this property is SOLD. To view more properties similar to this, visit our New Brunswick property list, here.